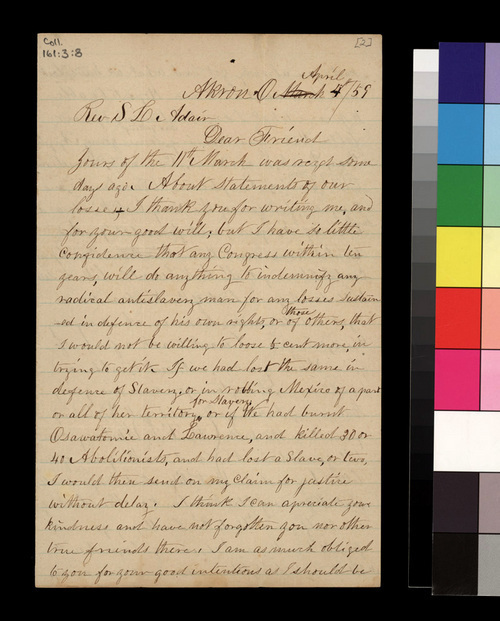 Jason Brown writes to Samuel L. Adair from Akron, Ohio, in response, evidently, to an earlier letter Adair had written him concerning placing a claim for property lost while in Kansas Territory. Brown writes that he didn't think any radical anti-slavery supporters would receive any funds from Congress in the near future. He believes that if he had been on the pro-slavery side, his claim would have been paid. He asks Adair to check his young son's (A. Brown) grave in the Lawrence cemetery to ensure that T. L. Whitney had built a picket fence around it, as he'd requested, and to pay Whitney if it had been done (or that Adair would have it done and Brown would reimburse Adair).